We actually had Lao Wang Ji Beef Noodles 老王記牛肉麵 twice during our time in Taipei. The last time we visited, we had tried Taoyuan Beef Noodles, which is also a nearby shop to Lao Wang Ji, but because it was closed, we ended up checking this spot out. 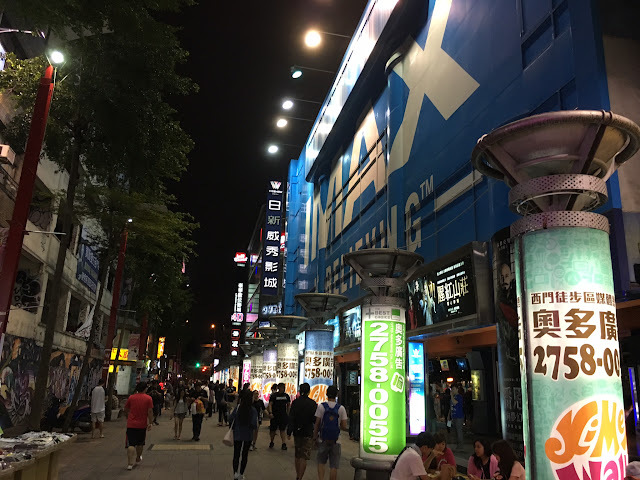 It’s not too far from our hotel in Ximending – around a 10 minute walk, so it was no surprise we visited twice. I think this might be my favourite beef noodle soup restaurant in Taipei. S got the Clear Broth Beef Noodle Soup which comes with loads of beef. The beef is thick but extremely tender and it falls apart! 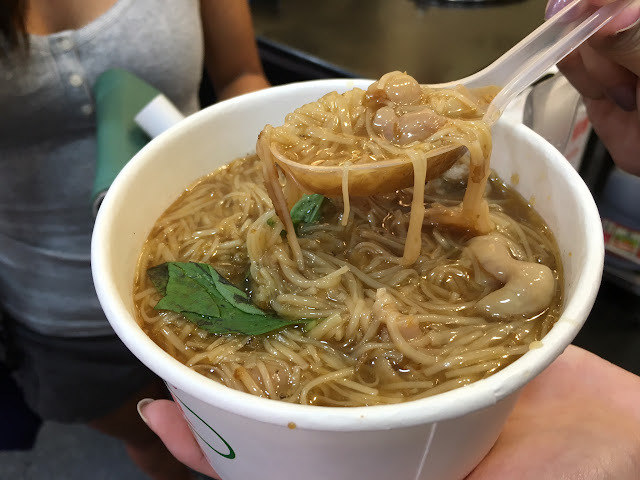 The noodles are cooked just right with a nice bite and the broth is clear but flavourful. The other option is to get the Spicy Beef Noodle Soup which is what I got. The spicy soup isn’t actually too spicy but I thought it was really flavourful! Just a touch of spice and I loved how the beef was soaking the soup in. On the table, there is also a bucket of preserved vegetables which you can add as much as you like. I do find that it tastes really great with the noodles! Overall, a must try in Taipei! Thirsty from lunch and the heat, we decided to get a Pudding Milk Tea from Ching Shin Fu Chuan 清心福全 which was in the Ximending area. Apparently they feature some healthier drinks and teas, but I don’t think this one was healthy! It was nice and creamy though. Not bad! After lunch, we decided to take the train to Taipei Main Station and do some shopping around the area. Shin Kong Mitsukoshi is one of the largest shopping malls with 4 buildings in total in the area. There is low end to high end shopping here. 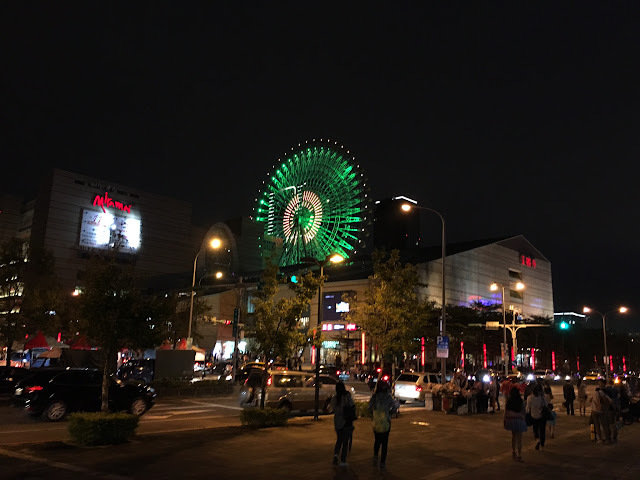 A nearby mall called Breeze also is worth stopping by. Especially if you like Line Friends! They have super picture worthy spots including this large bear! We also wandered to a nearby mall called ATT 4 FUN and on the top floors, they have tons of food and dessert shops. They even had a floor that was Peter Rabbit themed. We ended up trying a dessert shop called Bingirl 冰果甜心. We ended up sharing two desserts with the first being an Oreo Peanut Butter Pancake. The portions were pretty big but I found this to be a bit too sweet. The pancakes were okay but nothing special. I think the Mango Ice Cube is what they are really famous for though. There are a few other flavours but we chose mango and it is topped with kiwis and lots of aiyu jelly on the bottom. It is literally a giant ice cube of mango juice. Think of shaved ice texture but it’s been solidified! it’s also topped with a scoop of vanilla ice cream. We definitely got a brain freeze from this and it’s a bit too much for two. I’d say two desserts would be good for sharing between 4 people. After dessert, we hung out with my friends for a bit at the arcade before looking for a quick dinner in the Ximending area. As we wanted something quick, we ended up getting some street food. 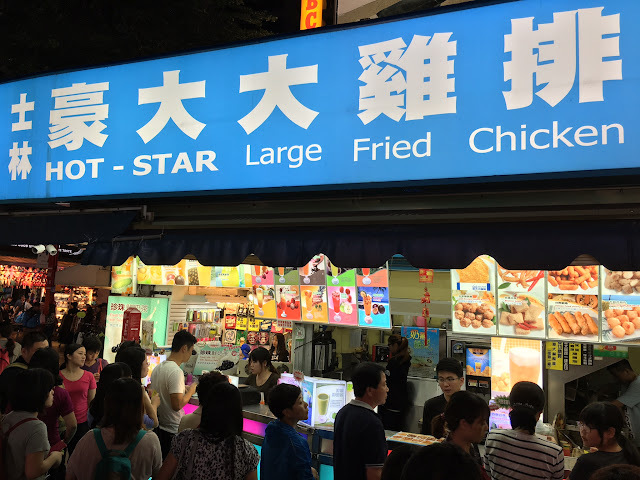 Hot-Star has a large outlet in the Ximending area and always has crowds. They are famous for the large fried chicken and is one of S’s favourites. I cannot wait until they open the store in Vancouver! 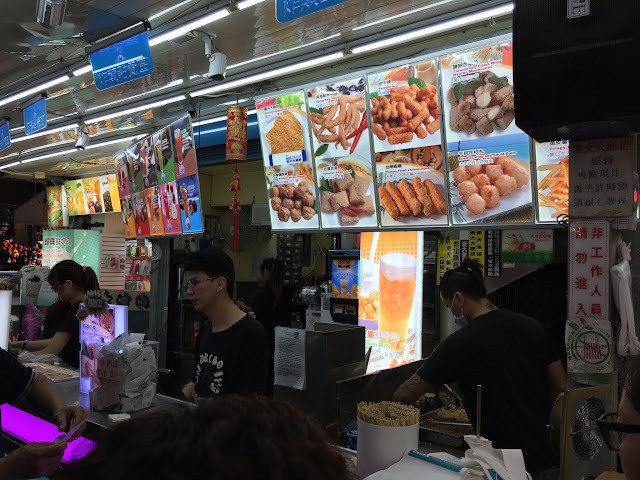 Other than the large fried chicken, they also have various deep fried snacks. 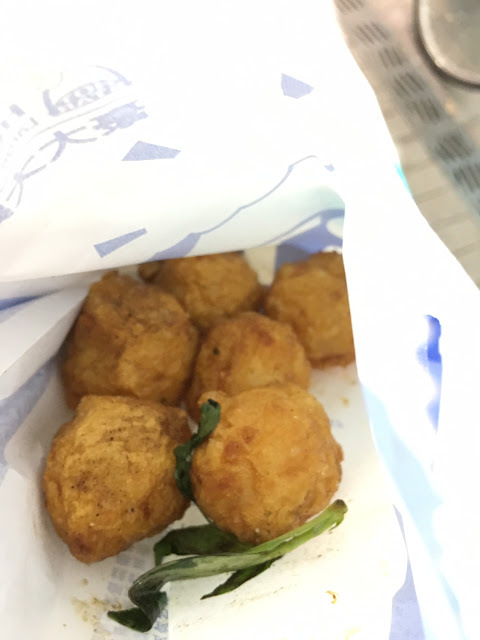 We tried the cuttlefish balls and mushrooms before and they were both very good! A trip to Taipei also means checking out Ay Chung Rice Noodles 阿宗麵線. 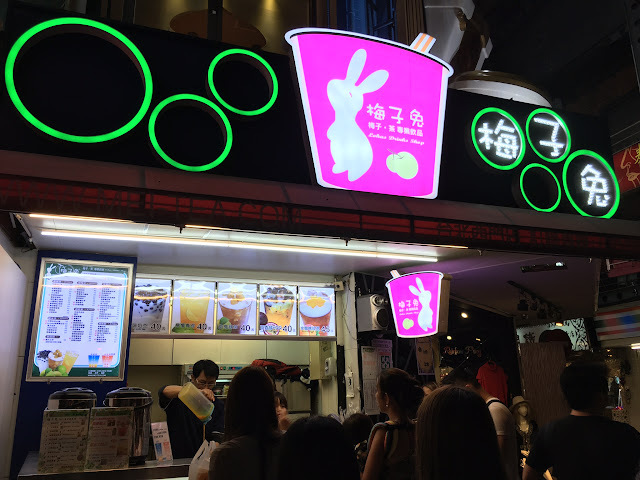 They are also located in Ximending but a bit away from the busier streets. There aren’t many chairs, so most people will just stand in front of the store to enjoy their food. The rice noodles are in a savoury broth mixed with intestines. We actually don’t eat the intestines just because we aren’t a huge fan, but the noodles and broth are absolutely delicious. To be honest, these intestines are also not bad as they don’t have any pungent taste to them. Just chewy, but the fact is I know what it is, so tend to stay away from them! After our quick dinner, we headed back to our hotel to grab our luggage and headed to the airport. And that’s a wrap on our trip to Singapore and Taiwan! Until next time! Since S’s birthday was shortly after our trip in Taipei, I decided to do an early birthday meal for him since there are so many nice restaurants in Asia. I ended up deciding on L’Atelier by Joel Robuchon which is located in the beautiful chic mall called Bellavia. I had made reservations in advance by sending an email online and I was able to get a response quite quickly. The restaurant actually was awarded a Michelin star last year shortly after we had visited! So even more of a reason to visit! I decided on the set lunch course menu and when you make the reservation, they will ask what type of seating arrangement you’d like. There is counter/bar seat, high table, or lower couch seat. We decided to go with the counter/bar seat because you got a view of the kitchen showing the action of the chefs. The interior of the restaurant is actually quite dark but with cool lighting and red and black tones. From our seat, we could see the chefs preparing our food. And all the ingredients in the kitchen. It was definitely quite exciting! We decided to go with Menu A which is offered only during weekday lunches. For $1,380 NTD, you get an amuse-bouche, your choice of 1 appetizer, 1 main course, dessert, and coffee or tea served with petite desserts. To start, we are given a LARGE basket of bread. I have never seen such a big basket for two people. But wow, the variety is amazing and the bread itself tasted absolutely delicious! I think there were at least 6 pieces of different bread so over 12+ pieces for the two of us. I wanted to save room for the rest of the food, but I couldn’t stop eating the bread! Oh, and another note is that even if you order still water, it will come in a bottle. So we ended up paying almost $10 for a bottle of Evian water. We started with an Amuse-Bouche which was sort of like a mushroom soup. Quite a nice palette cleanser! For appetizers, S got the Chicken Wings and Mushrooms Fricassee served with Chateau-Chalon wine sauce. This was nothing like we’ve had before but the flavours were delicious. It was almost like a deconstructed chicken wing with the chicken already de-boned. The foam was also a cool twist. For myself, I got the Duck, Foie Gras and Pistachio Pate with Young Bitter Salad. I loved how it was paired with a mustard sauce. The pate was also wrapped with a bit of puff pastry so it was quite different from the usual. For the main course, S got the Braised Pork Cheek with Red Wine Sauce and Seasoned Vegetable. The pork was very tender and the sauce was hearty. A great main course! For myself, I got the Lamb Shoulder Confit with Vegetables Couscous and Coriander for my main. This wasn’t what I was expecting because the lamb shoulder was shaped into a circle. The flavours were quite tasty and it didn’t have any gamey taste it. For dessert, S got the Bahibe Chocolate Ganache with Coffee Sorbet. What a beautiful dessert with so many different textures. For myself, I got the Banana and Milk Mousse with Coconut Ice Cream and Honey Caramel Chips. Again, this was a beautiful dish and even the plate was perfect! The flavours were refreshing and I especially enjoyed the honey caramel chips! As I mentioned in my reservation that we would be celebrating a birthday, they asked if I wanted to add a birthday cake for $150NTD. I decided to add it, but probably could have skipped it because we were already very full from the 3 course meal. However, it was nice that they added a candle and a message to make it extra special. This was a chocolate cake with different textures on each layer. To finish, we were provided with Petite Desserts and they included macarons and little puffs. As if we didn’t have enough desserts already! To end our meal, you can choose your choice of Coffee or Tea. I decided to go with a Earl Grey. Overall, it was a great meal given it’s only $60 a person for a famous restaurant and the dishes were very unique. However, since the restaurant has been awarded a Michelin star, the same menu now costs $1,580 NTD which is around $70. Still, I think it is well worth it! After lunch, we decided to walk over to Taipei 101 to get some quick shots. We had gone up to the observatory last time, so we skipped it this time around. I then suggested that we hike Elephant Moutnain 象山. We got to MRT Xiangshan Station, and took Exit 2 and walked alongside a park. Then, you will find some signs telling you to take a left to go to Xiangshan Hiking Trail. You’ll then find this sign which is the beginning of the hike! The hike itself only takes around 20 minutes but it was actually quite grueling because of the heat and the steep steps. I advise doing this late in the afternoon, because the heat will really get to you. Along the way, we found some cute statues with the Chinese words Elephant Mountain. The steps up top became not as steep so it was a bit easier. However, be warned that there’s tons of mosquitoes and it doesn’t help when you’re sweating too! Definitely put on some bug spray before you head here. As we approached the top, the sun was setting! The view from up top is truly quite beautiful. A different view from Taipei 101 because you actually get to see Taipei 101 from here! And if you wait until the sun fully sets, you’ll see Taipei 101 turn on its night lights. If you want to set up a tripod for your pictures, be sure to come early as there will be lots of people around sunset! After we finished hiking, we headed back to our hotel to freshen up as we would be meeting up with my friends who were also in Taipei. Didn’t end up taking pictures as we just wanted to enjoy the moment but we had a nice dinner and drinks and headed to a rooftop bar called Frank’s and called it a night! On the very last day of our trip, we took it pretty chill. Actually we were taking it pretty chill the last few days since we had seen most of our “must-sees”. Our flight would be around 11pm that night so we actually had pretty much a whole day. 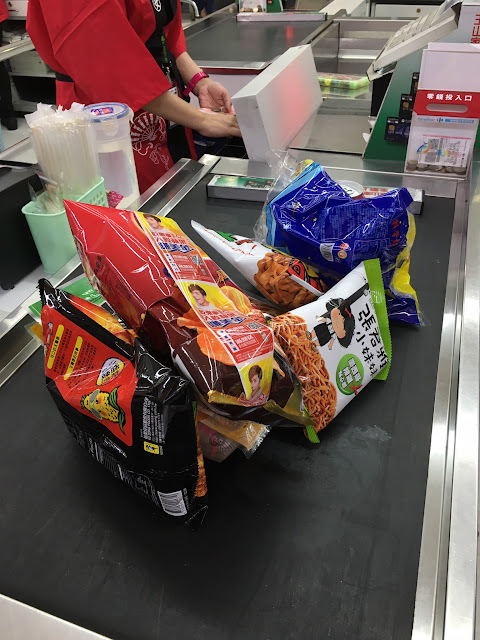 I’m a sucker for interesting snacks from different countries, so I dragged S to the closest grocery store with me. Ximending is pretty touristy, so the closest one was actually a Carrefour 家樂福桂林店. It was a bit of a walk, but I wish we had found this earlier since the snacks and drinks here are much cheaper! 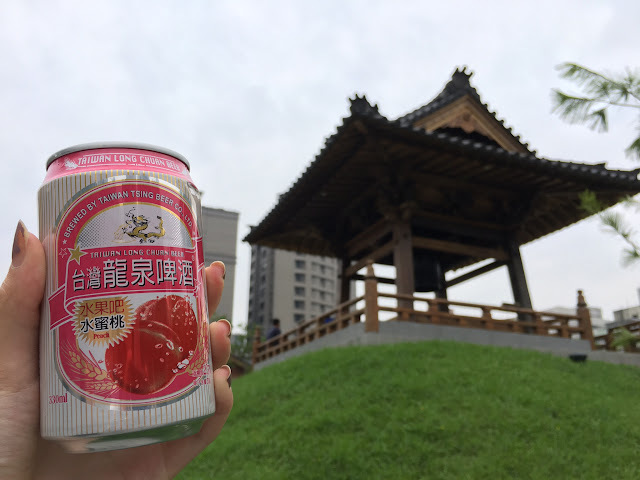 We picked up this Lychee Beer at Carrefour and enjoyed it while walking back to Ximending. S got hungry and he couldn’t leave Taipei without his fair share of fried chicken. 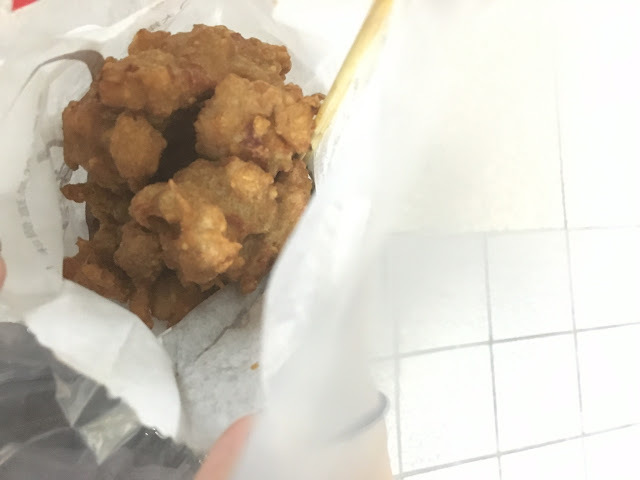 If you have been following my posts on this trip, you probably know that we have been eating fried chicken every day…literally… Anyways, he went to Ji Guang Fried Chicken 繼光香香雞-西門店 again. Always a line up here! This time, we also picked up the Deep Fried Oyster Mushrooms. Pretty good! And of course the Fried Chicken was tasty! And when I said we were taking today chill, I was serious about this because we headed to Tom’s World to shoot hoops again… S will never get sick of this place. I guess we were just trying to act like locals. 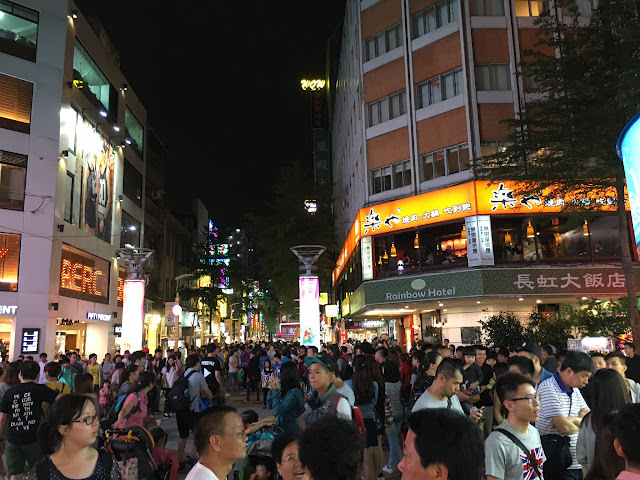 If you head down to the very end of Ximending, you will find that there are many theaters here. I think there are around 3 right next to each other. So trying to act like locals, we decided to catch a movie. We chose the IMAX 3D theater called Vieshow Cinemas 信義威秀影城 and watched the Tightrope. Movie tickets here are around NT$430 so pretty expensive! You can however bring outside food and beverages from in. The theater is pretty big and American movies are played in English with Chinese subtitles. The only downside is that any parts with a foreign language are subtitled with Chinese. And that was our 2 week trip to Singapore and Taiwan! I am already reminiscing the good food and times we had on our trip. Can’t wait for our next trip! Until then, back to Vancouver eats! The next morning, we decided to head out Ximending to look for food for brunch. This place is always bustling with people! Luckily, many of the street vendors had already opened up. First up was this Green Onion Pancake stall. You can add different flavours or even add cheese or pork fluff to name a few. We decided to get the original and it cost only NT$25. 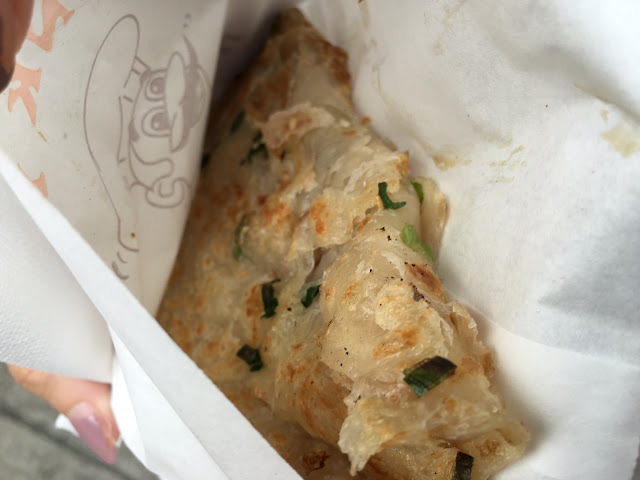 I wasn’t expecting much from this, but this was probably the best Green Onion Pancake I’ve had! It had such a nice char and they brush on this sweet soy sauce. Delicious! Continuing on, we tried this Grilled Tempura. Lightly brushed with a sweet savoury sauce, this is fun to snack on. The pieces are quite big though, so i got a bit sick of it after one. Good for sharing. NT$30 for a skewer. I also decided to get some Hong Kong Style Curry Fishballs. 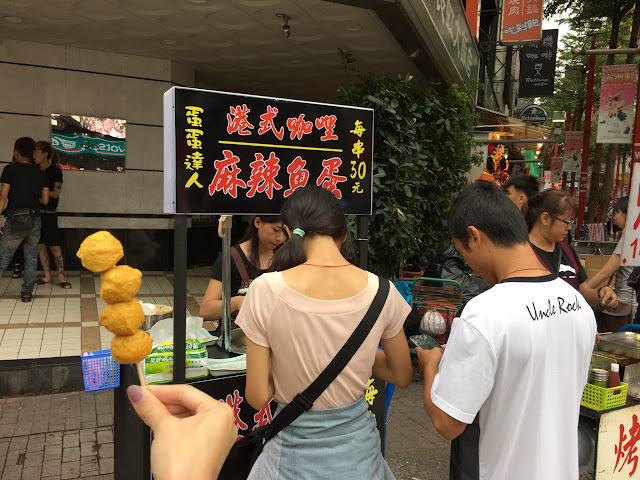 What was I thinking getting fishballs in Taiwan? Yea…these were not good. The curry was not apparent. Perhaps I should’ve gotten the flaming spicy flavour. NT$30 for 4 fishballs. Getting thirsty, we headed to a 7-11 to look for some drinks. I got the Apple Milk while S got the Papaya Milk. I love how convenient these 7-11s are and how cheap the prices are. The papaya milk was really good while the apple milk was alright. I found it to be slightly tart so it tasted odd. I finally convinced S that we should leave Tom’s World and go do some exploring since we traveled all the way here. Well, we ended up checking some items off my to-do list and that included buying souvenirs. 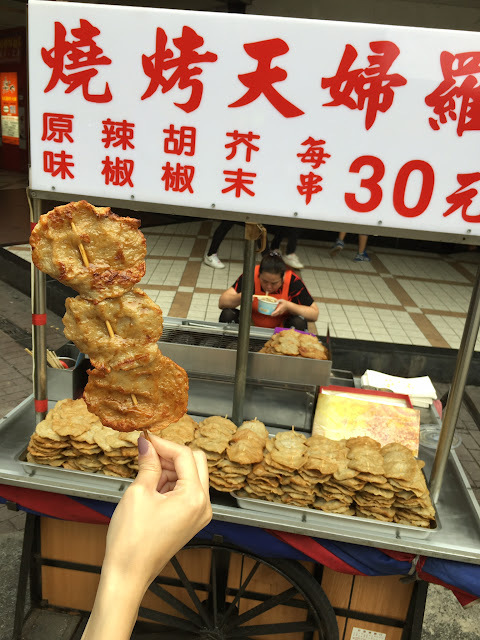 ChiaTe Bakery 佳德糕餅 is known to make some of the best pineapple cakes (鳳梨酥) and it’s a must buy when visiting Taipei! 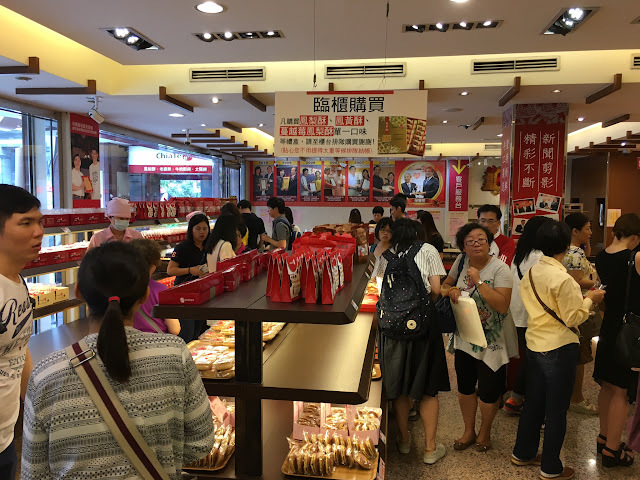 I believe they only have one bakery in Taipei and you can get here by taking the MRT to Nanjing Sammin station and walking straight ahead after you take Exit 2. When we entered, it was quite a mayhem inside with all the tourists grabbing the pineapple cakes off the shelves. The pineapple cakes are not cheap as they around CAD$2 for one. They have different fillings as well, but after trying many, I still think the original pineapple filling is the best. The filling is not overly sweet and doesn’t stick to your teeth. The outside cake is buttery and flaky. Highly recommend! They also sell other products like wife cakes (老婆鉼). After doing some pineapple cake shopping, I suggested we visit the Wu Fen Pu Garment Wholesale Area (五分埔). You can get here by taking the MRT to Songshan Station. 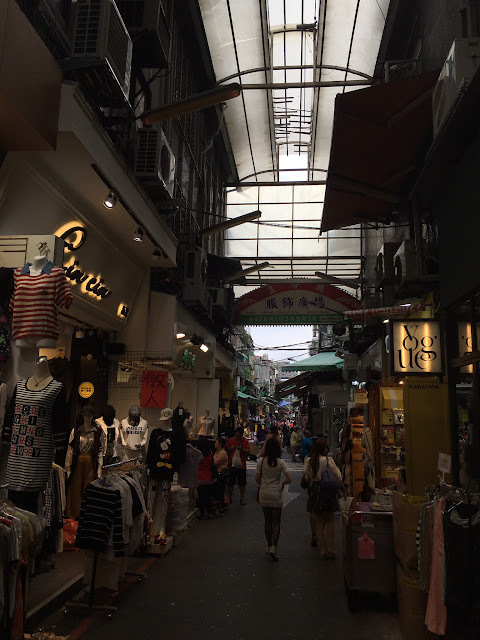 It is an area known for the largest wholesale garment market in Taipei. The area is a huge maze with many shops selling mostly women’s clothing and accessories. I did find that the styles were not as trendy as the ones in Shida and Ximending though. Still, not bad and I picked up some cheap scarves. 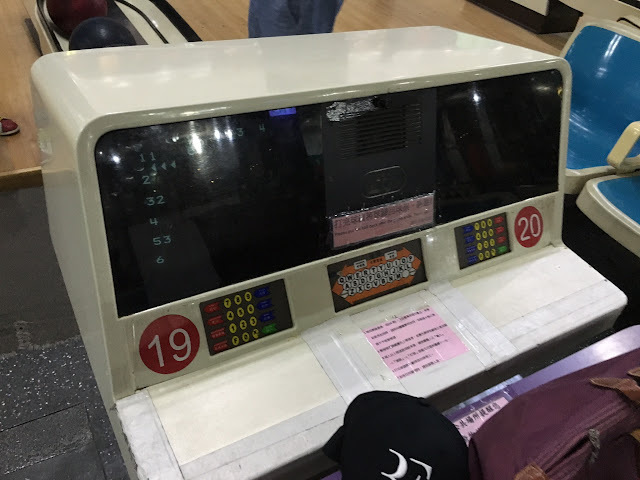 Because S was super bored shopping with me, he suggested we go play bowling at E7 Play (AGAIN). Well, unfortunately, since it was a weekend, the place was super busy and we wouldn’t get a spot until late. So instead, I suggested we do more touristy things! We took the MRT to Sun Yat-sen Memorial Hall station and visited the Sun Yat-sen Memorial Hall. 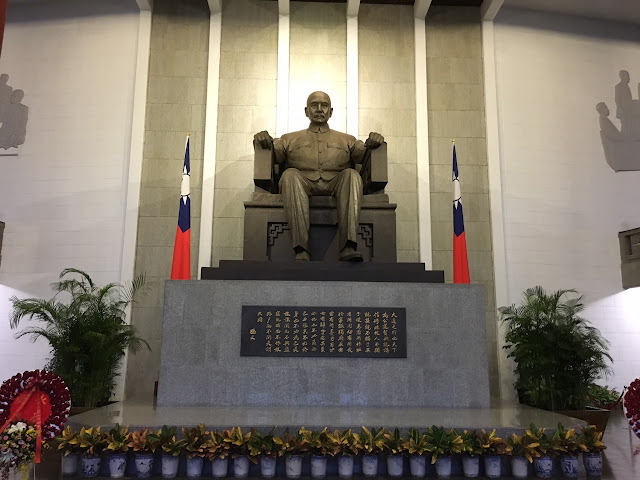 This is a memorial to the Republic of China’s National Father, Dr. Sun Yat-sen.
Dr. Sun is known for his Three Principles of People: nationalism, democracy, and the people’s livelihood. 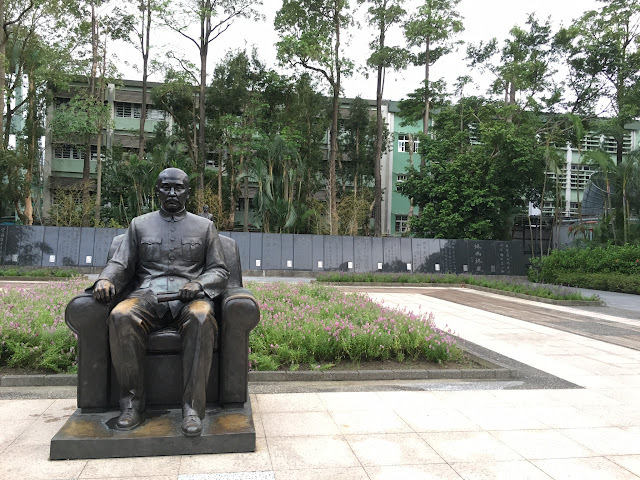 Inside the main entrance, you will find a statue of Sun Yat-sen. There is a changing of the guards every hour but we had missed the last one. The building also displays Sun’s life and the revolution he held. There are also gardens around the memorial hall and you will find many young dancers practicing here. 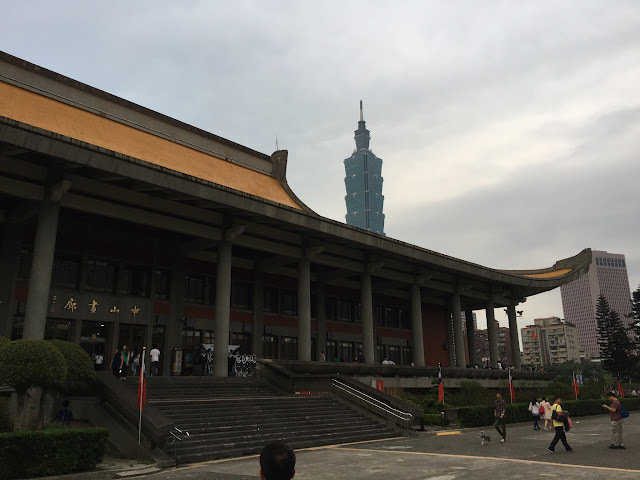 It’s also a perfect spot to see the full Taipei 101. After, I suggested we visit Ice Monster since it would be a short walk from the the memorial hall. They are famous for their shaved ice. You can either order take-out or sit in. It was rather chilly that day so we chose to sit-in. The cafe is brightly lit with wooden decor. You order and pay at the entrance and they will bring you your dessert to your table. We chose the Fresh Mango Shaved Ice because that’s pretty much their signature item. The ice is super light and comes with a scoop of mango ice cream and tofu pudding on the side. At first, we thought there was very little mango but it was actually all on the bottom of the bowl. There were tons! It’s around NT$250 and great for sharing between friends. After dessert, we took the MRT back to Ximending 西門町and wandered the streets again. You can never get sick of this place! Love the lively crowds and at night you will see many street performers. S couldn’t resist and had to try the Hot Star Large Fried Chicken 豪大大雞排 at the Ximending location. This location is extremely busy as well. At this location, they also have a variety of other snacks and also drinks. The wait here was much longer because they have so many other menu items. There is really only one guy who makes the fried chicken so the wait was super long. We also got the Fried Scallop and Squid Balls. These were seasoned with basil leaves so quite tasty. I didn’t really taste any scallop in it though. 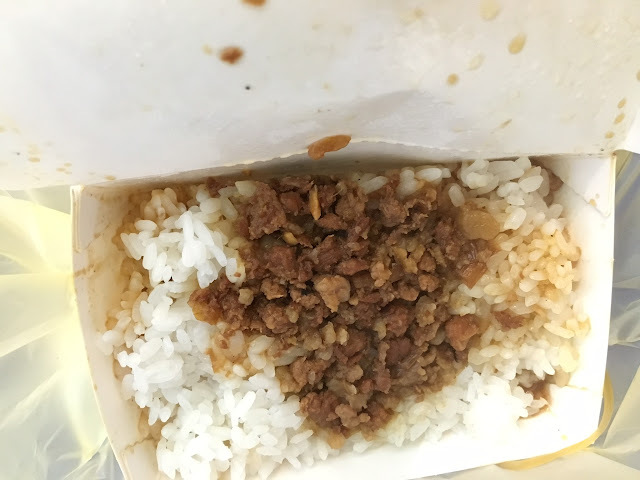 I was also on the hunt of Stewed Pork Rice 魯肉飯 so we got take-out at Tian Tian Li 天天利美食坊. They also have sit-in. It looked pretty underwhelming but it actually tasted okay. Just hard to eat while standing. I didn’t think it was very special but it’s quite the comfort food for locals. Plus it’s only NT$25! Thirsty, we found a corner shop further away from the busy shops called Mei Tea 梅子兔. Look for the bunny rabbit and the long line ups. We got a classic pearl milk tea to finish our night off. It was a long wait but this was very smooth and satisfying! Headed back to the hotel and did some packing as we would be leaving tomorrow night. 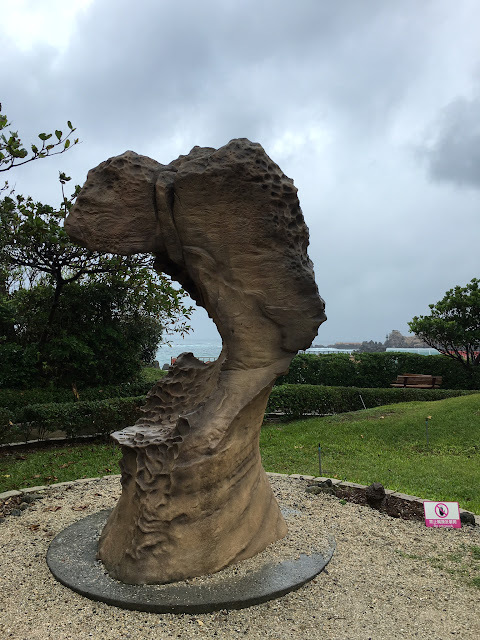 On our last full day in Taipei, I suggested that we check out Yehliu Geological Park 野柳地質公園. However, Taipei finally decided to rain on our last two days. It started off as light rain in the morning so I convinced J and S that we should still go. 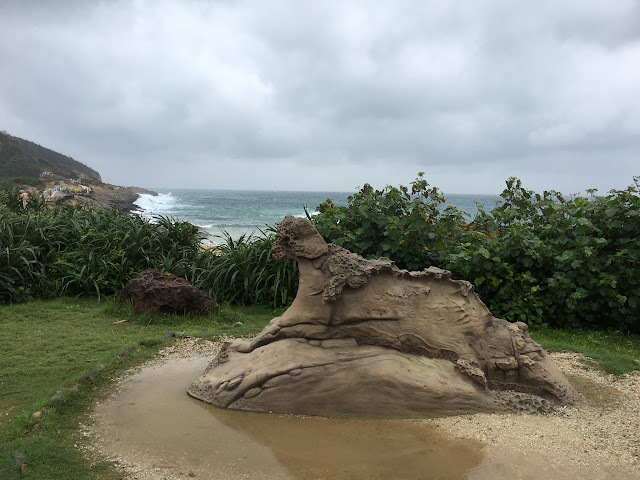 Yehliu is a cape in the town of Wanli, New Taipei. It is around 1.5 hours by public transportation. We took the MRT from Ximen STation to Taipower Building Station. From there, look for the 1068 bus towards Nanshi. 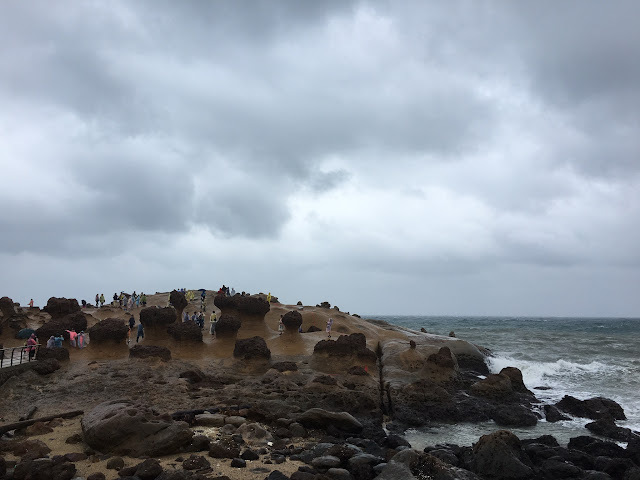 You will get off at the Yehliu Geopark stop. It is then a 5 minute walk to the entrance but it took us much longer because it began to pour. It is also extremely windy here as it is on the coast. 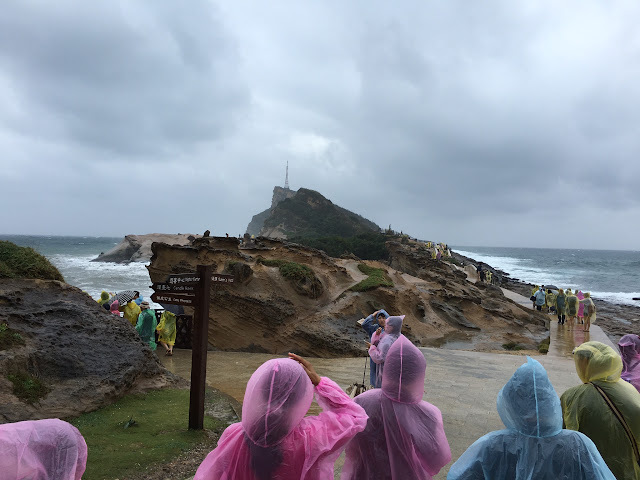 There were people selling rain ponchos as an umbrella really did no help with the wind and heavy rain. Admission is around NT$80 for an adult. 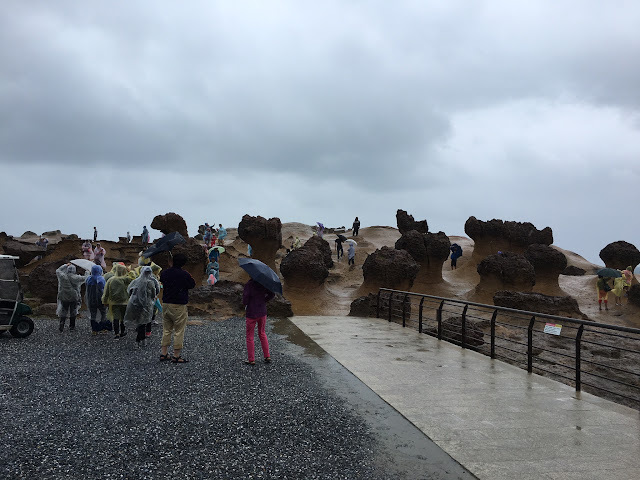 Yehliu Geopark is famous because of the amazing rock landscapes created by nature. Because of the waves and rock weathering, there have been many interesting rock formations. One of the most famous is the Queen’s Head (女王頭). We found this later on but it was raining too hard to get a good picture. We instead got a picture of the duplicate of the Queen’s Head which is really a replica. The real one looks pretty much the same. We also found this leopard chilling in the park. This is also a replica because the real one had collapsed back in 2010 during a typhoon. Of course, the park is not filled with these replicas. The park is pretty big and there are signs pointing you to formations that you may want to see. It was raining quite hard and the real formations were quite far out so we didn’t end up seeing too many. One of my favourites were the Mushroom Rocks. So cute! They also have Ginger Rocks and Camel Rocks but we didn’t end up seeing them. If you look carefully, the real queen’s head is the tiny rock with a circle of rocks surrounding it. You can walk down to the bottom level to get a better view. As it was raining and freezing cold, we really weren’t in the mood to look any further. A bit of a waste, but I’d love to come back to visit next time when it’s sunny. Really interesting if you’re into geology! We were hungry and cold so we decided to eat at the closest restaurant. There are many seafood restaurants further away from the park near the town, but we were too exhausted. 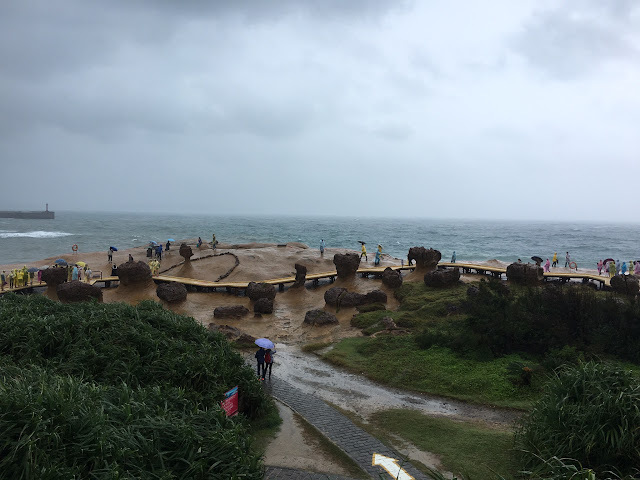 We quickly headed into Shark Bites Toast 鯊魚咬土司野柳店 which is next to the Yehliu Ocean World. The restaurant is a milkshake and western food cafe. We started off with a Papaya Smoothie even though we were freezing cold. Pretty good. J got the Pesto Risotto which he said was pretty good. S and I shared a few snacks. First was the Deep Fried Chicken Nuggets topped with fries. Pretty good but not as good as the ones from the street or night market. Plus it’s pricier. We also got the Deep Fried Chicken Wings which were also topped with fries. Again, they were average. Nothing too special. After lunch, we decided to just go back to Taipei city center. My original plan was to go to Keeleung for it’s famous night market. This would be around an hour of public transport but would be worth it since we were already quite far from the city. We were all tired and cold from the rain so unfortunately we skipped this. I would highly suggest checking out other cities nearby since you are already so far out from the city. 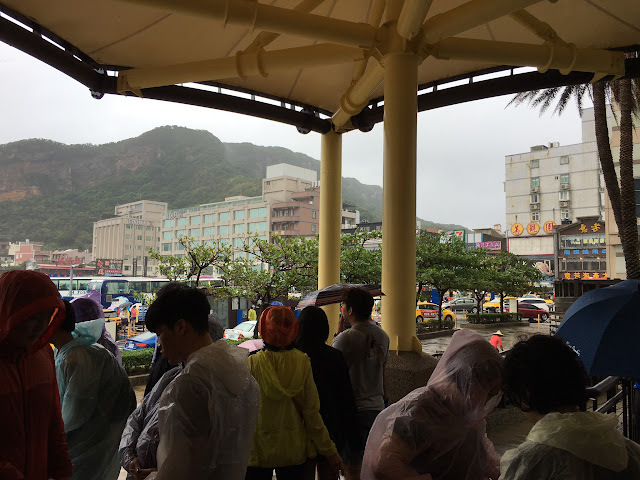 Many people choose to go to Jiufen or Yangmingshan National Park on the same day. After drying up back at our hotel, J took us to Rahdesign Cafe. You can get here by taking the MRT to Dazhi Station. The cafe is perfect for coffee lovers as they are famous for their coffee. Apparently three national champions from the World Barista Championship opened this cafe. The inside is pretty hipster and has ore of a European feel. You’ll find many locals here with their laptops doing homework and such. I got the Matcha Latte and it was beautifully presented with latte art filled to the rim. Very good! S got the Ice Cream Coffee. This was my favourite! So good! J also suggested we get the Mochi Waffles. These are so good! Drizzled with honey and topped with a very light whipped cream, the waffles are filled with chewy mochi inside. Prices are around NT$100-170 for beverages, but still a must try! Such a cute cafe to visit! J then suggested we visit the Miramar Entertainment Park. You can take the MRT to Jiannan Road station to get here. This is a shopping mall which is famous for their IMAX theater with one of its movie screens being the largest in Asia. 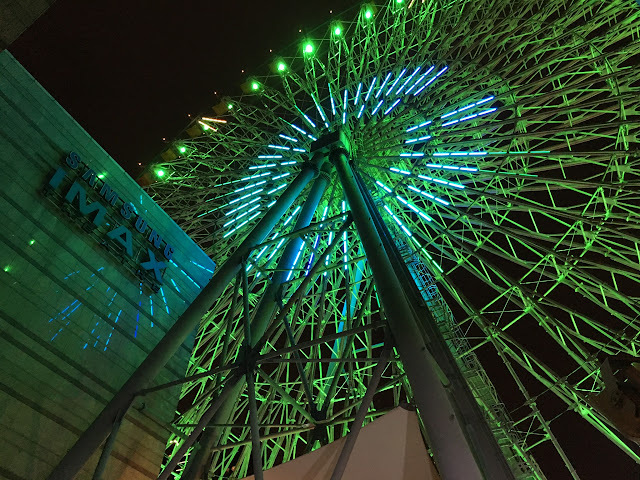 Another famous attraction at the mall is the Ferris wheel on the roof of the mall. 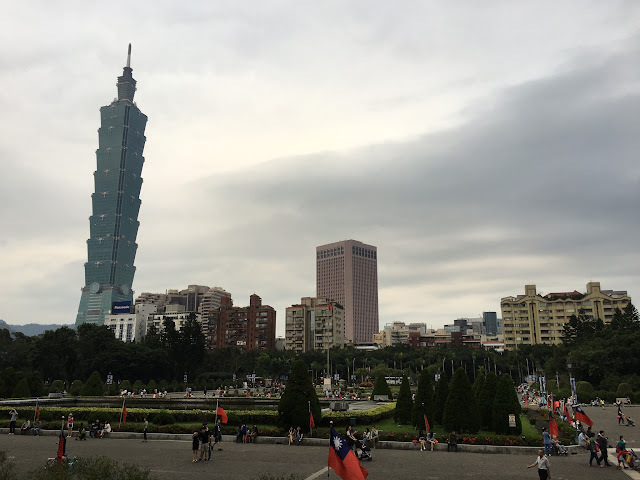 It is the second tallest in Taiwan. 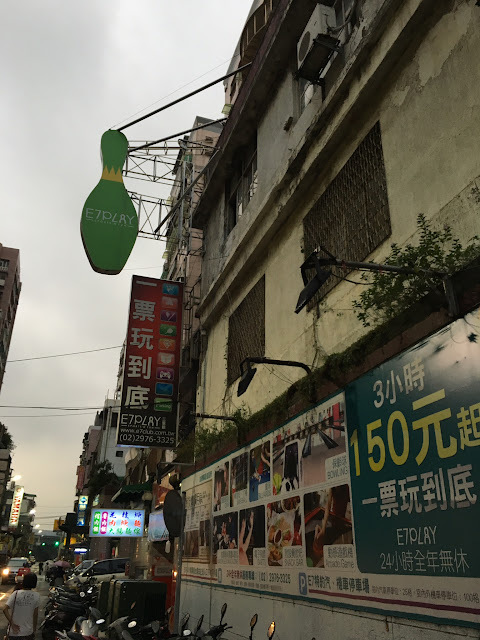 We weren’t really in the mood for shopping, but the guys were in the mood of bowling… E7 Play was pretty far and we felt like it would be busy, so J did some searching and found Yuan Shan Bowling Alley 圓山保齡球館. It is near Jiantan MRT station and also right across Shilin Night Market. The alley is quite terrible. 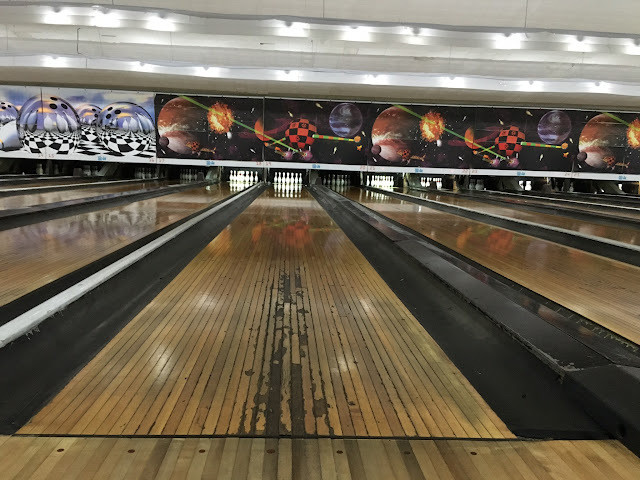 The lanes are rugged so your ball does not bowl straight since there are dents on the lane. The balls also have dents everywhere so nothing rolls smooth. The balls were also really oily and everything felt dirty inside. Price was also not as cheap as E7 Play. Our pinsetter would also screw up multiple times. It was just a disaster. Since we were right across Shilin Night Market, we decided to go there again for dinner. I’ve been seeing stalls selling these Flame Grilled Beef Cubes 火焰骰子牛. They place these beef cubes on a grill and then torch them with a flame. NT$100 for a portion. These were so disappointing though! They were way overcooked and super chewy. The beef had so much fat attached that you could not chew. Really sad because I’ve heard great things about them. While the guys were lining up for the beef cubes, I couldn’t help but look over at the next stall selling mini sausages. A small bag for NT$50! Mmm these are really good and fun to eat! We decided to head down to the basement floor and sat down at this restaurant. They offered a variety of classic Taiwanese dishes. J was really hungry so he got a bowl of Beef Noodles. He said this was just average. We decided to give these Bite-sized Crab a try. I was slightly creeped out by all the crab legs and the fact I was just eating mini crabs with the whole shell, but these are deep fried so they are very crispy. They are only seasoned with pepper and salt. Not bad and would be good for sharing with a large group. We also got this Grilled Squid but I didn’t like it at all. Again it was only seasoned with pepper and salt, and I found it to be rather unflavourful. It still had that slimy texture as well. I was expecting the ones at Japanese restaurants, so it was quite a disappointment. As J would head back to Kaohsiung that night, we decided to have some Taiwan Beer to end the night. A very light beer so it was easy to drink! We also headed to 711 to check out some local snacks. We found the Honey Beer this time and throughout the trip, I’ve been trying out almost all their flavoured beers. I quite liked this one as it has a sweetness to it. They sell these in the BC Liquor stores now, but at almost CAN$4 a can! J also told us that these snacks are really good. They are actually instant noodles with seasoning packs where you shake it up and eat the noodles dry. Not good for you, but great as a midnight snack! After a late night out, we started our day off rather late and met up with J and SC again. Since they are pretty much locals, they took us around Ximending for brunch to show us the top eats. The first stop was Ay-Chung Flour-Rice Noodle. When we arrived, there were tons of tourists crowded around the area either in line or eating. They really only sell one thing and that is the Flour-Rice Noodle. A large bowl goes for around NT$65 while a small is NT$50. S and I decided to share a bowl so we got the large, but it was quite big! Essentially, this is a hot bowl of really soft rice noodles along with pork intestines in a very thick flavourful broth. The pork intestines threw us off a bit but the chewiness gives it a pretty good texture. You can add vinegar and chili sauce to make it even better. The broth is really good and makes a great breakfast. There is always a line but it moves really quick. Walking around, we found that there were many food carts around and we saw the peanut taro ice cream wrap again! We first had this in Jiufen, and were excited to have it again because it’s that good! This is so addicting and perfect on a hot day. Love the crunch and sweetness of the peanut brittle shavings along with the ice cold taro ice cream. 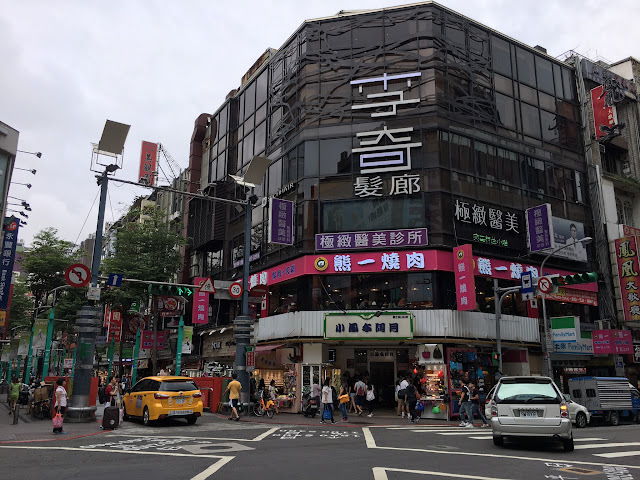 After grabbing some snacks on the street, we wandered the streets of Ximending and J suggested that we go to Tom’s World Arcade on the fifth floor of Wannian Plaza. The arcade is pretty big and there are a variety of games. 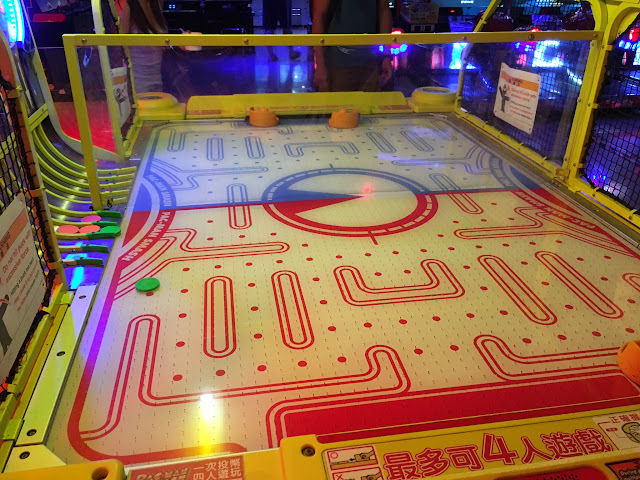 Our favourite was this air hockey which is great for four people and the number of pucks it spits out is ridiculous at points of the game. Not your typical air hockey table for sure. The boys loved playing the basketball game. S and I took our dancing skills to the test with this awesome Dance Dance Revolution which senses your motion. 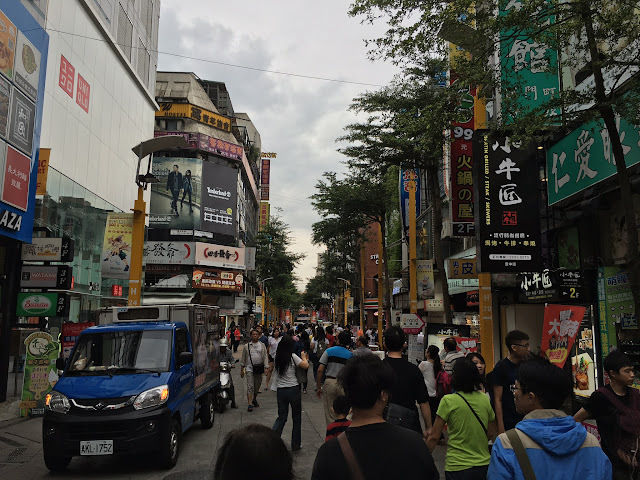 After some fun at the arcade, we headed back to the streets of Ximending and looked for more snacks. 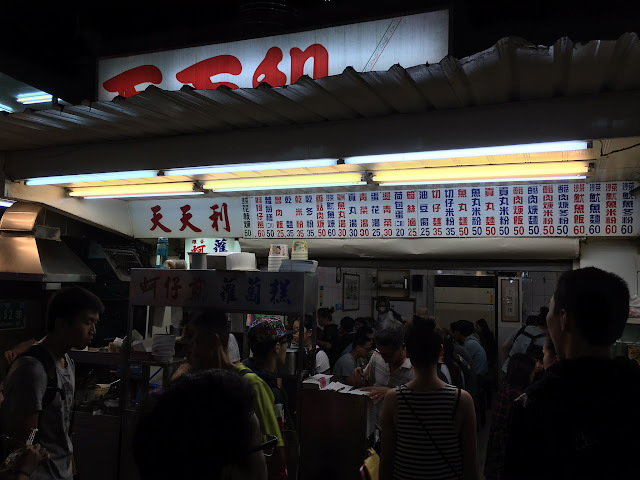 J said that the Ji Guang Fried Chicken 繼光香香雞-西門店 is really good. 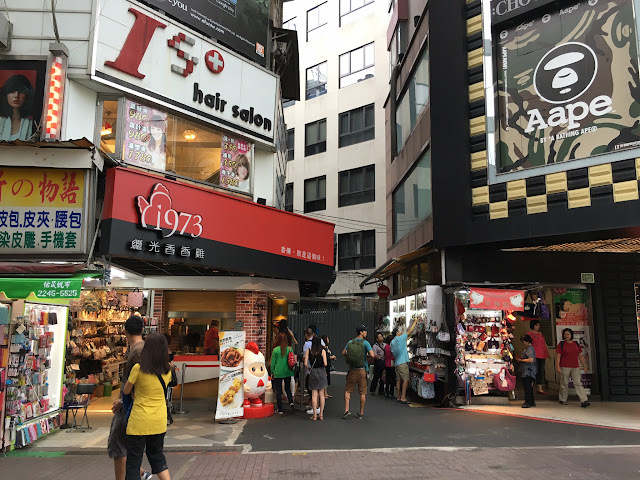 It is super easy to spot as it is the corner shop with the 1973 sign in red just across the Ximen MRT station. 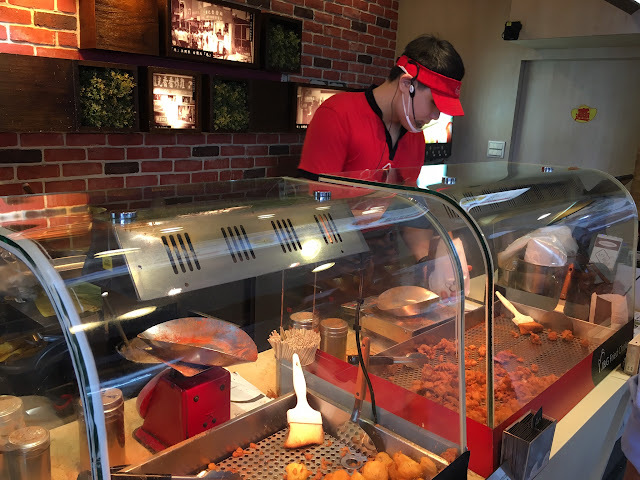 The guy is super friendly and they make sure the batch of chicken is fresh and that you’re not getting pieces of just fried batter. We got a freshly made batch and it was steaming hot. I like how these like popcorn chicken so easy to eat on the go. We started off with a dessert which was the Brown Sugar Cake. I quite liked this as it was sort of chewy and not overly sweet. Of course we couldn’t come here without trying the milk tea. 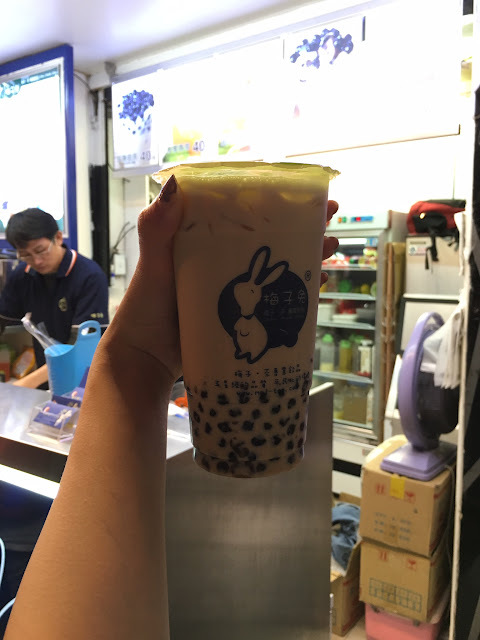 We got a classic Pearl Milk Tea and a Tieguanyin Pearl Milk Tea both in the large size. 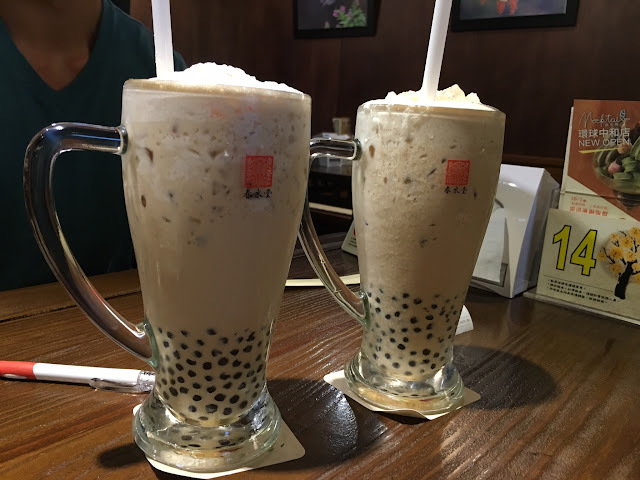 They feature the tiny pearls which I quite liked and the top was foamy from the shaking of the milk tea. My favourite was the Pearl Milk Tea as I found the Tieguanyin to be a little too strong in the tea flavour so it was a bit bitter. If you love to drink tea though, this might be a good choice for you. Their bubble teas run a bit on the higher end at around NT$150-170 for a large size. Very big though so you can easily share with a friend. 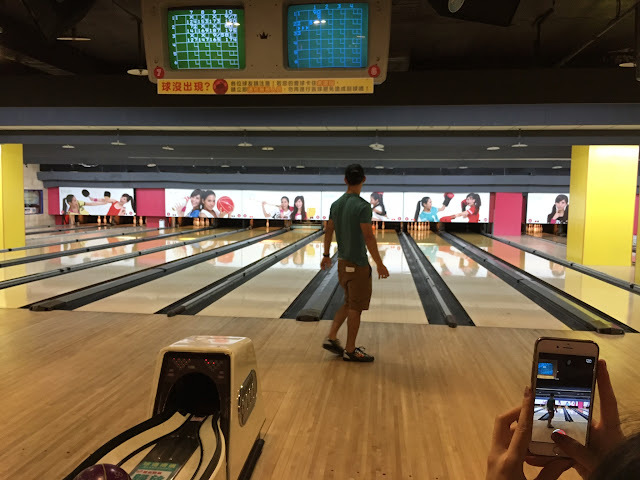 After snacking (once again), we decided to check out the bowling alley since J and S love bowling… J suggested we go to E7 Play 三重店 which we had take the MRT to Taipei Bridge Station and then take a short walk in a pretty random area. Such a witty name because E7 Play in mandarin means “let’s play together”. 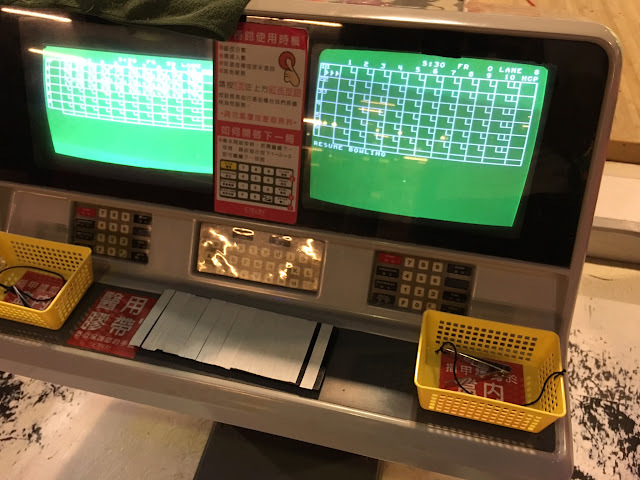 Bowling here is super cheap. 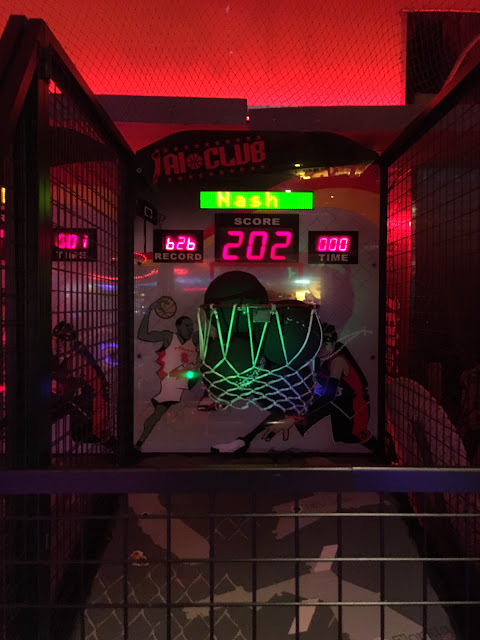 I think it was around CAD$12 a person for three hours unlimited play and free shoe rental. What a deal! I found it funny that they also have nail clippers here, perfect for us girls who break their nails easily. And they even have tape to cover your nails. 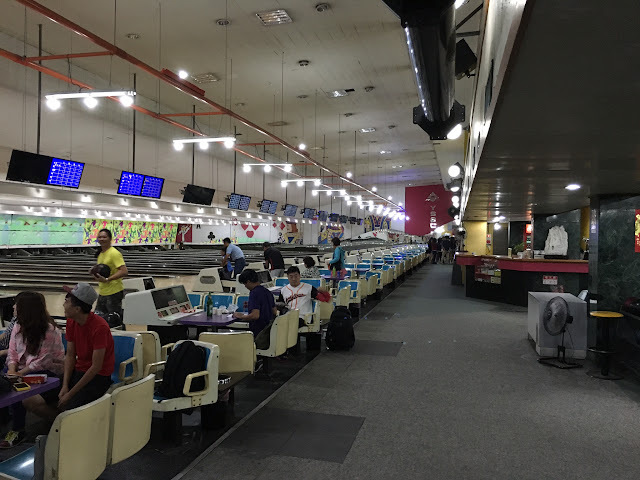 The lanes are pretty new and we had no complaints. Be sure to bring someone who can speak mandarin here though as their English is limited. After bowling, we took the MRT to Jiantan Station to visit the famous Shilin Night Market. Despite there being a Shilin MRT station, the closest to the night market is actually Jiantan Station. 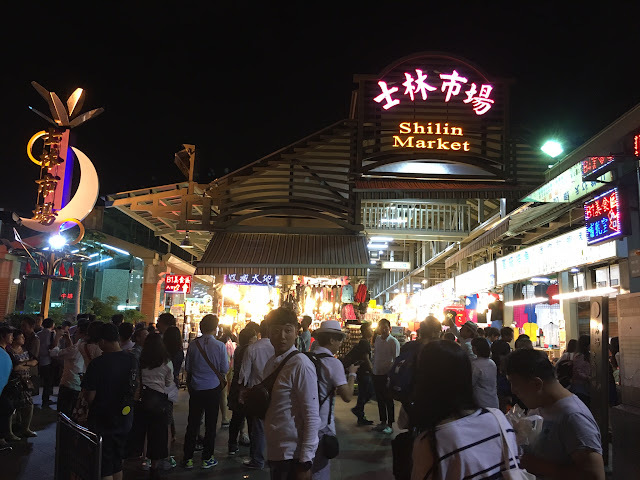 Shilin Night Market is one of the largest and most popular night markets in Taipei. It is also the one that most tourists will visit. The first stall you will see when you are coming from the MRT station is this yellow fried chicken stall. We saw a huge line up so we quickly got in line. Look at all that oil…so unhealthy but so good! Fried chicken is around NT$70. 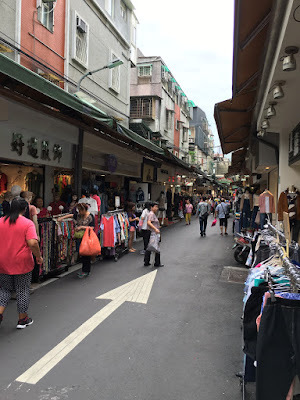 I found most items in Shilin to be more expensive because it’s where the tourists go. We ended up being quite disappointed with the Fried Chicken from this stall. It was actually more of a grilled type of chicken even though it is deep fried. It didn’t have the salt and peppery taste we were expecting but rather a teriyaki like sauce. I would skip this next time. While the boys were lining up for the fried chicken, I headed over to the next stall which was Fried Milk. The Fried Milk here is very good! The lady warned me to not eat it right away because it is piping hot. 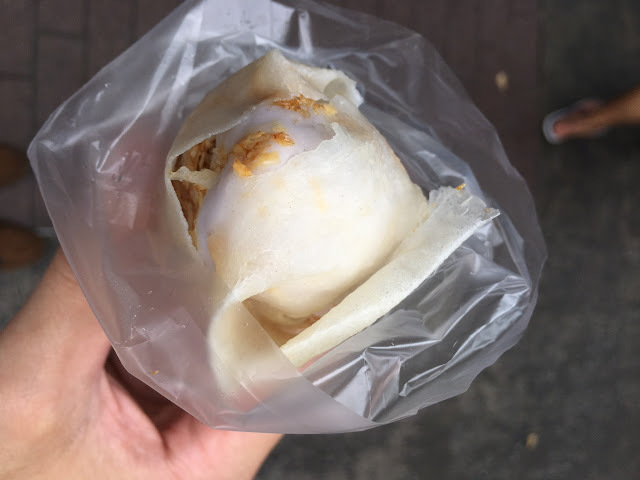 The outer layer is crispy and the inside is sort of like a mochi texture with the milk flavour being strong. Remember to take small bites when you eat this! J said his all time favourite is to eat at Zhong Cheng Hao Oysters 忠誠號. This is a sit in restaurant although I think you can order to go. Sit in turnover is pretty quick though and you can even order one item to share and they won’t question you. Look for the red signage. They are famous for their Oyster Omelettes so of course we had to get this. Man, this was the best I’ve had. The egg is fried so the edges are crispy and the amount of gooiness was just right. I also loved the sauce they used. A must try! We also got the Deep Fried Stinky Tofu. These came with a side of picked cabbage as they usually do. These were pungent but perfectly crispy on the outside with the sauce being soaked in in the centre. 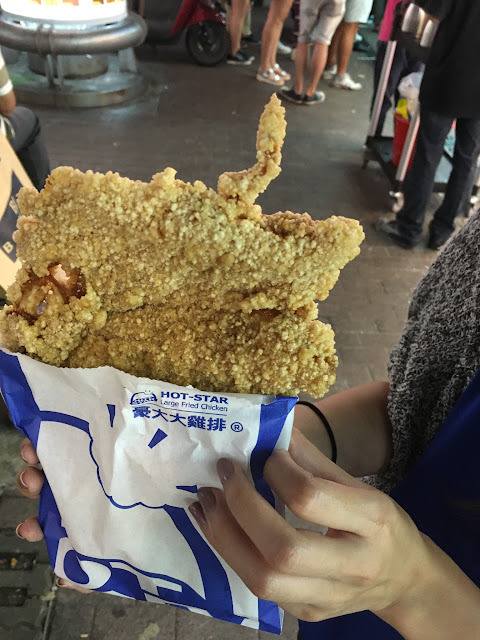 The famous Hot Star Large Fried Chicken is what people come to Shilin for. 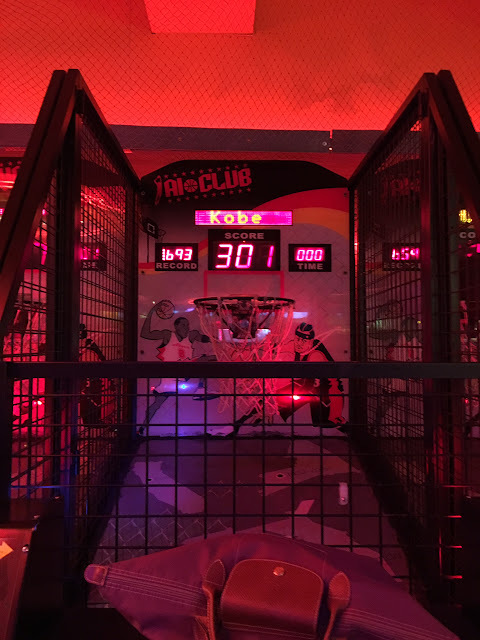 They actually have one in Ximending as well which we try on a later day, but we think that this is the best location to get it. Of course, there is a line up, but it moves pretty quick as usual. For just around CAD$2, you get a HUGE piece of fried chicken. Shilin Night Market also had an underground food centre that seems to be less popular for tourists. Here, you can sit down to eat your food so great if you want to skip the pushing and crowding outside. You will find more seafood type items that require more care in refrigeration. That night, it began to rain, so it got pretty messy. Rain and night markets don’t mix well. We decided to just grab one last drink and head back to our hotel. 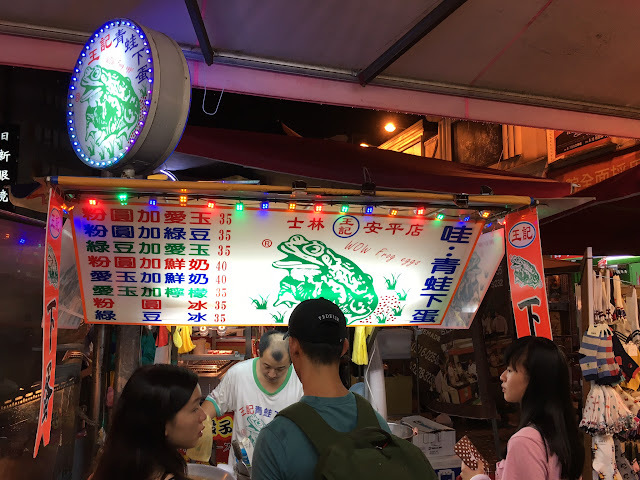 This stall featured the Frog Eggs Drink. This is of course not actually frog eggs! Rather they are clear tapioca-like balls that look like frog eggs. We got this served with aiyu jelly and it was cold and refreshing. There is not much flavour to it but only the lime flavour. On our fourth day in Taipei, we took the MRT to Beitou station. It took around 30-40 minutes from Ximen. Upon exiting, you will smell the sulphur from the hot springs. 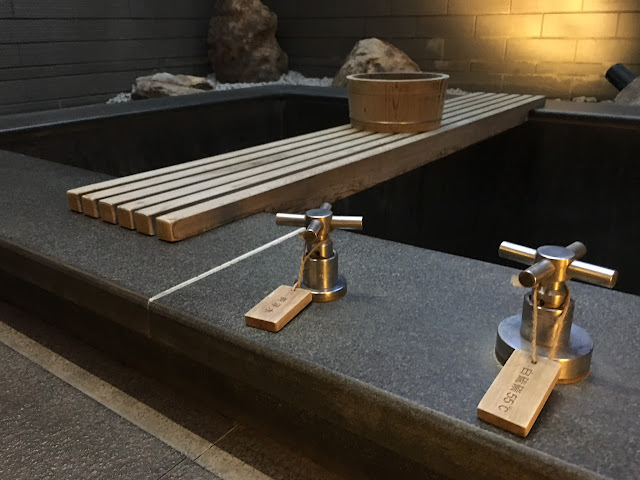 Beitou is famous for its hot springs and is also the most mountainous and highest of Taipei’s districts. We had pre-booked a private hot spring in advance as they are reasonably priced compared to the ones in Canada. 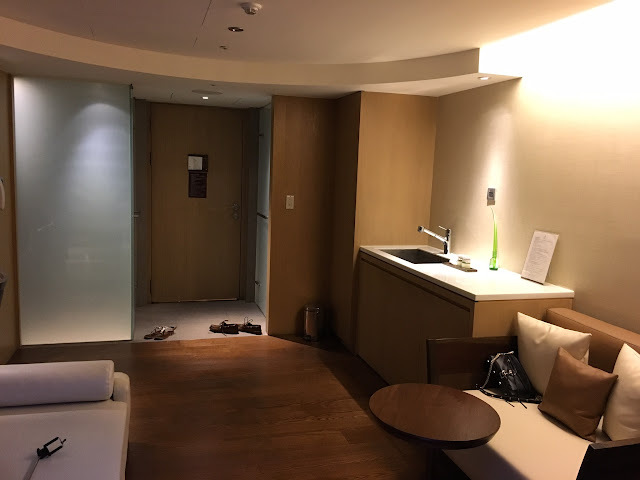 I did some searching and chose Grand View Resort in Beitou. The great thing is that they offer a shuttle bus from Beitou MRT station and drive you up the hills (which you otherwise would need to walk or cab). The resort is gorgeous! I found service to be rather cold, but the people here can speak fluent English. The great thing is that you do not have to stay here to use the hot springs. You can just pay for a one-time use charged by time. They do however offer hotel rooms with hot springs within your room. That is so neat and I would love to try it sometime. You can choose between public or private hot springs. 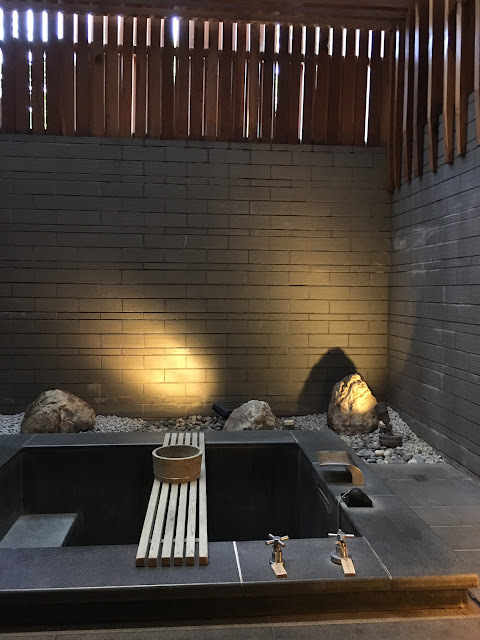 We ended up choosing the private hot spring where you get an independent bath house with the hot bath outdoors.They have different rooms with designs that are a bit different. You can email the resort to ask for the pictures. We chose Ylang-Ylang. The room was spacious and had a couch, private shower, bathroom, closet, and sink. For our room, the hot bath is outside. They have high brick walls so there is absolute privacy but you can still sort of hear the people next to you when you’re outside. The price is fixed at NT$2,300 for the room and allows two guests for 90 minutes. You can add NT$600 for each additional guest. The 90 minutes includes showering and getting dressed. They will call you 15 minutes before your time is up. This was a super relaxing experience and we enjoyed that it was private. The other option for hot springs was to use the famous Millennium Hot Spring which costs a fraction of the price but is filled with people. We opted for this so we could really relax. Plus it was super clean. They also provide you with all amenities you need, whether it be shampoo, bath wash, lotion, makeup swabs and even a brush. They also provided these cute little matcha panna cotta kind of desserts. It was refreshing to eat after being in the heat. After the hot springs, we took the shuttle to take us back to Beitou station. They are only able to drop you off at the Beitou main station. Therefore, we had to walk back up the hills to go to sight see the area. 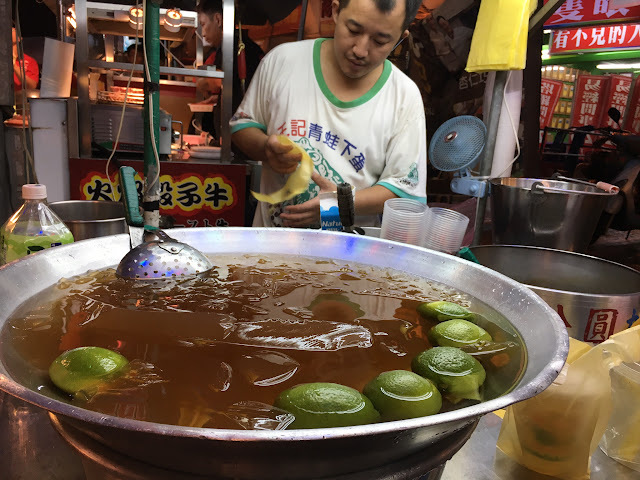 Along the way, we found 山西刀削番茄牛肉麵, which features hand-cut noodles. We got their famous hand cut noodles which were mixed with beef and vegetables. The plate was large and good value. We also got their fried rice which was pretty good. All their dishes had that wok flavour. The ambiance is rather shabby, but we found many locals coming here during lunch hours. Of course, we had to get some beers as our drinks along the way… Fruit beers are the way to go! After around a 15 min walk, we found Beitou Hot Spring Museum. The building was actually built as a public bath house under the Japanese rule and was once the largest bathhouse in east Asia. Today, the bathhouse is a free museum where you can see the old bathhouse on the ground floor and other history of how hot springs became significant in the area. Only downside is that they have no air conditioning in here, so it’s super hot inside still! 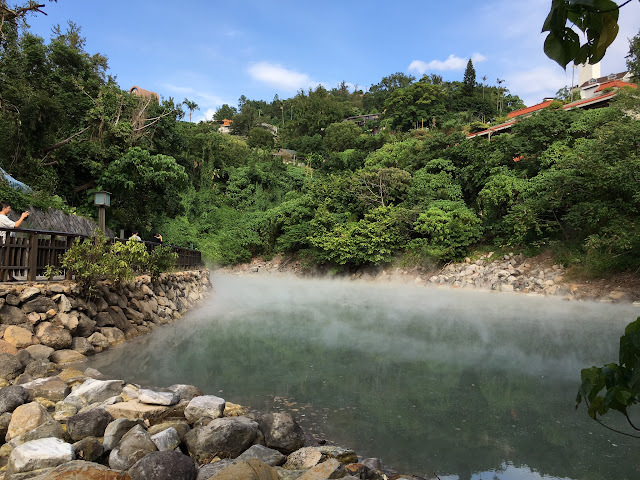 Take another 5-10 minute walk, and you will find the Beitou Thermal Valley (地熱谷). It is also known as Hell Valley. The Geothermal Valley is a volcanic crater filled with steaming natural sulfuric hot spring water and has a temperature between 80 to 100 degrees Celsius and therefore is fenced. Not the best place to linger around on a hot day, but it’s pretty neat! 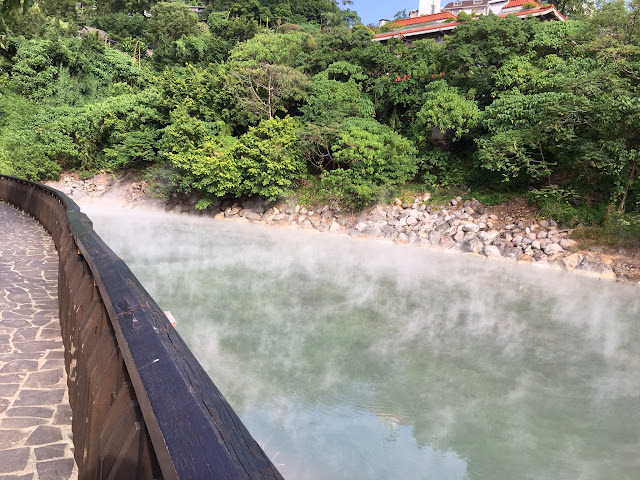 The water from the Thermal Valley are the source of the hot spring bathing facilities in Beitou. The water contains radium, which is said to have beneficial health affects for fertility, long-term illnesses, rehabilitation, and skin beauty. After exploring Beitou, we took the MRT to Dongmen Station to meet up with J who had took the train from his city to meet up with us. So nice to have a Taiwanese take you around! He took us to Smoothie House (思慕昔) for some desserts pre-dinner. Smoothie House is now a chain dessert shop and they have so many flavours! The menu looks so appetizing already. We got two shaved ices to share. Both were mango flavoured with tons of fresh mango. One had a pudding on top while the other had a scoop of mango ice cream. They were really good! The shaved ice is super thin just like the ones in Korea. 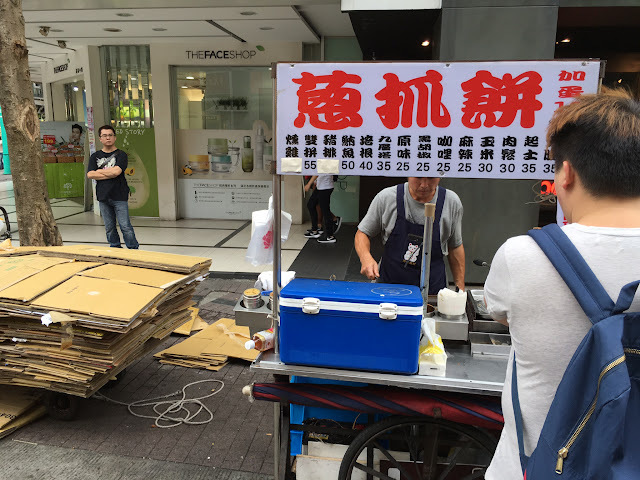 After shaved ice, we headed over to 8% Ice 冰淇淋專門店. I guess we were on a dessert hopping trip. 8% Ice is famous for their ice cream and is pretty hipster inside. Prices are not as cheap though, but the ice cream and popsicles looked delicious! J had the Passionfruit while me and S shared the Sakura Plum. We found the passionfruit to be too sour and the Sakura Plum to have an odd flavour. Flavourwise, they were just okay. Pretty to look at though. J said that the gelato is much better. We were going to meet our celebrity friend E for dinner that night, so we took a taxi to the restaurant. He had suggested to eat hot pot at 火鍋世家涮涮屋(台北延吉店). You get individual hot pots here and you can order a la carte or combos. Sort of Gokudo in Richmond. We chose the combos so they came with a variety of vegetables, shrimp, and fish balls and that sort of stuff. The combo also comes with your choice of noodles. I got the udon. S and I both got a meat combo, so we ended up sharing our meat. We got the regular beef and it was very good already. Extremely tender with the right amount of fat. We also got the pork bacon which was surprisingly quite good. The meat combos range from around NT$280 and can go up to NT$580 for premium cuts. The restaurant provides unlimited drinks, self-serve ice cream, and self-serve sauces. Quite a good value to get you full. After dinner, we decided to go get drinks. We ended up taking a nice walk after a huge meal and headed into the Da’an district where E normally hangs around. He took us to this nice cozy bar called Tickle My Fantasy. It was very quiet when we got there as it was rather early, but it got very crowded at the end of the night. E suggested we all get the famous Long Island. This is not your typical Long Island, but rather known to be potent. The ones we get in Vancouver usually have very little alcohol, but these were strong! We watched the bartender make our drinks and noticed it was mostly all alcohol. The drink is around NT$500 but a good deal because one drink will be enough. We all had a good night and it was great to see our friends again. As we stayed out past 12, the MRT had closed so we ended up taxing back to our hotel. A great night indeed.